In December 2007, Governor Sarah Palin gave Alaskans a nice present. She signed legislation boosting Alaska’s severance tax. The state would now take 25 percent of taxable income derived from oil and gas production. Previously it had been 22.5 percent. Severance or production taxes are one-time levies on oil, gas, and coal and other natural resources as they are severed from the ground. The move by a Palin, a Republican, capped an 18-month effort to change the way Alaska collects taxes on oil and gas. The movement began under former Governor Frank Murkowski, who advocated a profit-sharing severance tax and major tax incentives for energy exploration. In August 2006, the legislature approved a modified version of Murkowski’s plan. As a result, Alaska became the first state government to embrace an economic and geological reality: there is only a limited time to capture severance taxes. Furthermore, Alaska recognized — and capitalized on — the fact that oil and gas prices are inherently volatile, capable of generating enormous profits, as well as risking major losses. Palin, however, knocked Murkowski out of the political ring in an August 2006 primary. She took her state’s revenue-raising model even further, boosting the severance tax and giving even greater tax credits to industry. The re-worked plan is can now serve as a model for other energy states, particularly Wyoming. generous deductions for exploration and drilling, including a net profits tax and tax credits for small producers. This contrasts with the “regressive” flat rates used in Wyoming and other states. When oil prices spiked in 2006-2007, for example, Wyoming’s taxable mineral values actually declined. “Petroleum fiscal design, as practiced in most jurisdictions, like Wyoming, is back in the Stone Ages,” said Daniel Johnston, a Wyoming-born international energy consultant. Granted, coal — not petroleum, not even natural gas — is Wyoming’s primary long-term energy resource. Coal prices often respond slowly to market pressure due to longer-term contracts. Still, the combination of Alaska’s two features (a net profits tax, and a sliding percentage rate of tax) creates what economists believe is a more realistic approach in severance tax collections. It requires the government to participate in both the risk and the rewards of mineral production. Since 1981, when Wyoming passed its last severance tax increase, the legislature has passed 35 bills reducing severance tax or creating exemptions or tax credits for energy producers. In the same period, the legislature has passed only three bills repealing exemptions. The basic severance tax for oil and gas of 6 percent, plus a county ad valorem tax, has not been raised in 28 years. Wyoming currently allows a two percent severance tax exemption on stripper (marginal) wells. The state's fund provides during hard times. Had Wyoming employed something similar to the Alaska severance tax formula since 1981, Wyoming would have collected perhaps billions of dollars more in minerals taxes — and deposited a chunk of that into the state’s permanent mineral fund, the Cowboy state’s most important hedge against hard times. 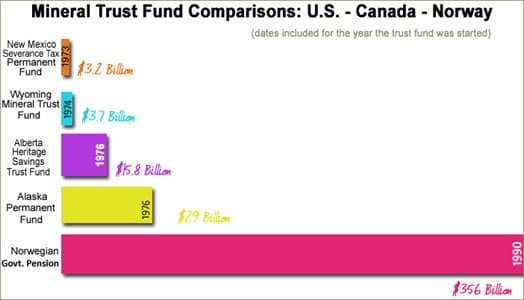 Alaska’s permanent fund, established in 1976, now holds about $28.5 billion. Wyoming’s fund, set up in 1974, now rests at about $3.7 billion. 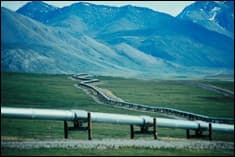 In 2007, Alaska produced about 650,000 barrels of oil a day, compared to about 108,000 barrels in Wyoming. But Wyoming’s natural gas and coal production dwarf that of Alaska. By most accountings, Alaska is getting more, at times much more, for its mineral resources than is Wyoming or any other mineral-dependent state such as New Mexico or Texas. A little more than a year after Alaska’s new severance tax system was put in place, there is guarded satisfaction in Juneau, although accountants figure that oil must remain over $45.00 a barrel for the new system to be an improvement over older models. With the recent dramatic changes in energy prices, it’s hard to tell how well the system works. “Fiscal Year 2009 may be one for the record books when it comes to oil price volatility,” wrote Alaska’s Department of Revenue head Patrick Galvin in a letter to Palin. Some have complained of overly optimistic predictions, but even with low oil prices, the Alaska’s new system, called ACES (Alaska’s Clear and Equitable Share) is bringing in more state revenues than older severance tax schemes. Energy-dependant states like Wyoming and Alaska need to position themselves carefully to get a commensurate share of revenue. Severance taxes raise a “fundamental conflict between government and investor over the division of risk and reward,” says Emil Sunley, a former director of fiscal policy at the International Monetary Fund who now consults internationally on structuring fair and flexible tax schemes. Should Wyoming consider increasing its base severance tax rate? Should Wyoming be more concerned about what happens in another energy dominated state like Alaska than it is with less energy dependent neighbors like Montana or North Dakota? 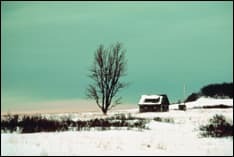 Should the state consider moving to a more progressive production-sharing severance tax formula based on industry profits, similar to that introduced by Governors Palin and Murkowski in Alaska? Should Wyoming lawmakers consider sharing severance tax revenue directly with residents as Alaska did in 2008 when it gave every man, woman and child in the state $3,269? Alaska’s overhauling of its severance tax revealed a willingness to act on a geological fact: the world is running out of cheap energy. Even at very high prices, certain fields in Alaska will be uneconomic within 25 years. Alaska recognized another trend: with the recent dramatic rise, then fall, in the price of oil, severance taxes must be elastic. Palin’s letters, statements to the press, and speeches reveal an urgency about severance tax collection almost completely absent in other mineral producing states such as Wyoming, Texas, or New Mexico. In Wyoming, Roy Cohee (R), Natrona County and speaker of the house, says there’s been no serious talk about changing the severance tax on minerals for the eleven years he’s been in the legislature. “Is there room for improvement? Probably. Is there room for discussion? Yes,” he says. The time is approaching, he says, for Wyoming to take stock of its finances. Wyoming Governor Dave Freudenthal doubts that his state could embrace an Alaska-style severance tax. “I don’t think we can do that last option,” Freudenthal said. Freudenthal said that Alaska has more choices about severance taxes because the state, not the federal government, owns much of the mineral estate. Actually, the federal government owns roughly the same amount of the mineral estate in Alaska (63.4 percent) as it does in Wyoming (60 percent). The state of Alaska itself does own more of its minerals than the state of Wyoming (24 percent versus 6 percent respectively) but that is not a factor in Alaska’s collection of severance tax. “These states (of the Rocky Mountain west) had to deal with a whole series of (federal) enactments including the Mineral Leasing Act of 1920 that Alaska never had to deal with,” said Freudenthal. Alaska gained statehood in 1959. Freudenthal’s observations on history do not necessarily mean that Wyoming should ignore worldwide severance tax trends. For example, Wyoming collects severance tax on gross value of the minerals. This policy can act as a disincentive to explore and develop new fields or mines. Worldwide, cheap and easily exploitable reserves have disappeared; energy companies face increasingly higher production costs. As a result, companies tend to respond to tax breaks in exploration, drilling, and transportation, not necessarily to tax breaks on the final product. “Lots of costs incur on the front end of oil production,” says Alaska Department of Revenue tax division chief economist, Cherie Nienhuis. “There are companies who explore for oil that don’t (yet) have taxable income,” she said. Severance taxes, unless severely out of line with business norms, play a limited role in a company’s decision on whether or not to drill. Instead, a company wants to know: what’s the total government take — its bite out of profits — including all rents, royalties and taxes. The idea of the “total take” is important to bear in mind. The average government take world-wide, according to severance tax consultant Daniel Johnston, is about 65 to 67 percent of the taxable value of the oil or gas. Oil companies get to keep between 30 to 33 percent of the value. Wyoming’s total take on federally-owned mineral leases average about 55 percent, said Johnston. Alaska’s take is about 60 percent. U.S. states dependent on mineral revenues can take a lesson from the policies adopted by sovereign nations whose chief wealth is oil, gas, or coal. According to Cambridge Energy Associates, a Cambridge, Massachusetts-based energy-consulting firm, roughly 70 percent of the world’s discovered oil is held by nationally-owned companies. Mark Thurber of Stanford University’s Program on Energy and Sustainable Development puts the number closer to 80 percent. Nationally owned mineral companies, known as NOCs, oversee a nation’s energy production. Typically, they operate with no competition because privately held mineral rights are not permitted. 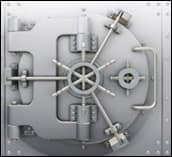 It’s estimated that Saudi Arabia’s NOC, Saudi Aramco, has ten times the reserves of ExxonMobile. This near-monopoly usually gives nations, the suppliers, an upper hand over the consumer. This isn’t always true, of course. In the short term, the basic laws of supply and demand still apply. As oil and gas prices continue to fall in 2009, mineral rich nation/states from Russia to New Mexico scramble to pay the bills. 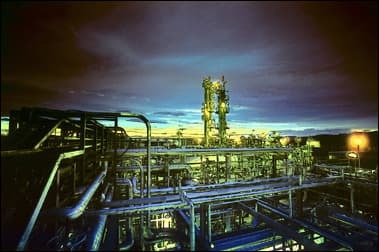 But the long-term picture of growing demand and dwindling supplies means that the consumer will pay more for hydrocarbon-based energy. Companies that lease and produce this oil, gas, and coal from a state, if they play their cards right, stand to benefit handsomely, often spectacularly, from this demand. Just as private corporations have a fiduciary responsibility to maximize returns to their stockholders, managers of state-owned oil and gas companies – or state-owned oil and gas supplies – have duty to their own constituencies: to maximize revenues to the extent the market allows. Governments, facing the depletion of a finite resource, need the assurance that their percentages of the overall profits, not just their revenue – will rise with the market price of oil, gas or coal. At first glance, this makes no sense. If revenues are going up, isn’t government’s take, as an overall percentage of taxable income, rising also? “Not necessarily,” says Frank Rusco, acting director of the U.S. Government Accounting Office, Natural Resources and Environment. Certain fixed costs, like a complex bonus system companies pay to operate federal leases, as well as tax deductions, are set at predetermined levels. “The government cannot adjust them as prices rise,” said Rusco. 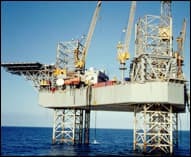 Johnston has calculated, for example, that in the Gulf of Mexico the state and U.S. government’s overall percentage of the profits begins to fall off when prices reach $35.00 per barrel. For example, at $20 per barrel, government royalties and severance taxes take about 54.6 percent of the taxable income; the oil company gets 45.6 percent. Yet when oil reaches $100 per barrel, the government’s take has fallen to 47.5 percent of the income while the oil company’s percent has risen to 53 percent. That may not seem like much of a difference, “but there are billions of dollars in that little sliver,” said Johnston. Johnston hardly fits the image of a rabble-rousing advocate bent on squeezing corporations. A self-described Republican and “industry kind of a guy,” who was born and raised in Sheridan, Wyoming, has spent most of his career helping oil and gas companies. Now he splits his time between consulting with oil-producing nations and energy companies including ExxonMobil, Halliburton, Texaco, Total, Unocal, and the Moscow-based Yukos. 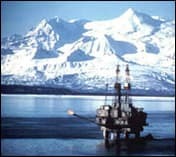 Johnston has also consulted with governments ranging from Alaska to Kuwait to Norway. He has worked with the World Bank, International Monetary Fund and the International Finance Corp. The Alaska experience poses important questions for all of the country’s energy states, but particularly for Wyoming where significant resources give the state leverage. Alaska and Wyoming occupy a unique position among energy producers: both depend on severance taxes to pay state operating expenses (65 percent in Alaska and 28 percent in Wyoming). Wyoming and Alaska are similar in other ways: low population, lots of empty space, and a political push-pull between conservatism and populism. Both states heavily depend on energy exports and are in the bottom quartile of states for using their own energy output. According to the U.S. Department of Energy, Wyoming uses only 0.5 percent of its total energy production; Alaska uses 0.8 percent. Texas, by contrast, uses 12 percent. In few other places are severance taxes more linked to state fortunes than in Alaska and Wyoming. With their oil and gas money, both states set up constitutionally protected permanent funds. In Wyoming, interest on the permanent mineral trust fund contributes 10 percent to the general fund. Residents of both states enjoy a high standard of living but have the lowest individual personal tax burdens in the nation. Neither state has an income tax. Although the state of Wyoming does not own as much of the mineral estate as the state of Alaska, and cannot match Alaska’s annual oil production, Wyoming, too, can be considered a sovereign state when it comes to energy. The energy future in Wyoming? 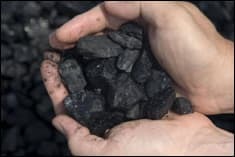 Wyoming leads the nation in coal production, is a strong natural gas exporter, and has the potential to be among the top wind and uranium producers. Using a measurement the U.S. Energy Information Administration calls Total Energy (coal, oil, gas, wind, and coal), Wyoming is ranked second in the nation behind Texas with 9,154 trillion BTU. That’s three times Alaska’s capacity. Given dramatic changes in energy supply and demand is Wyoming shortchanging itself on its energy income? Wyoming’s severance taxes on minerals, including coal, vary from 11.5 to 13 percent of value, depending on deductions given to stripper (marginal) wells and various county assessed valuations on producing mines and properties. Severance taxes on oil in other states range from 1.5 percent of taxable value in Colorado to 15 percent in Montana. As in Wyoming, these percentages may include a county property tax based on a yearly value of production. The particular mineral matters, too. Texas, for example, puts a higher severance tax on natural gas than oil. About 27 other states impose some form of severance tax, although in only 16 states do the collections add up to more than one percent of total state revenue. Although there’s been a recent dramatic drop in energy prices, most governments in the world now assume minerals are a precious asset and ask commensurate severance taxes and royalties. Norway, for example, imposes at least a 28 percent severance tax. In fact, oil and gas companies in Norway can pay up to a 78 percent severance tax, according to Kjartan Teigen, an economist working for the Norwegian Petroleum Directorate (NPD). Norway, like most foreign governments, doesn’t differentiate between a royalty and a severance tax. Seeking bargains for production cuts, energy companies commonly threaten to take their extraction operations somewhere with lower taxes. But they are running out of places to go. 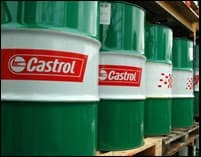 “For the past two decades the exploration end of the business has been notoriously unprofitable,” Johnston told a conference in Oslo in October 2008. In 2006, Paolo Scaroni, the chief executive of Eni, an Italian oil and gas company, spoke at an International Petroleum Week luncheon in London. “Energy firms are awash with enormous cash flows, but their opportunities to reinvest that cash are severely limited,” he said. Thus, despite Alaska’s hike in severance taxes, Eni invested $1.45 billion in Alaska’s Nikaitchuq field and acquired new leases in the state’s North Slope onshore lease sale. Severance taxes are political dynamite. Energy companies exert heavy influence over state legislatures; they fight to keep severances tax from being increased and apply steady pressure for reductions or exemptions. With the exception of Alaska, Texas, and Wyoming, most states do not have sufficient energy reserves to fight energy company pressure. Wyoming potentially has the clout but has yet to use it. But changing or increasing severance tax is not easy, as recent Colorado history shows. In the November 2008, energy companies spent approximately $11 million to defeat a 3.5 percent increase in Colorado severance taxes. The constitutional amendment would have produced about $300 million additional tax dollars which the state planned to start a permanent mineral trust fund and triple the financial aid available for college students. 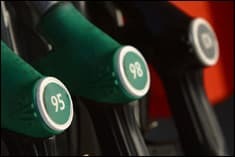 Campaigning against the increase, energy companies pushed the hot button of higher gasoline prices, already at $4.00 per gallon. Any jump in severance taxes, the companies told Colorado voters, would result in even high prices. Never mind that global demand, not severance taxes, drives gasoline prices. “In 2006, 95 percent of oil wells and 73 percent of natural gas wells were able to avoid paying taxes because they are stripper wells with low production rates,” said Marlow. Energy companies everywhere complain about state and federal taxes. Yet Wyoming has no corporate income tax. Furthermore, according to Denomy, producers get to deduct their state levied severance taxes and royalties from their federal corporate income tax. In 2000, Gerking, then a University of Wyoming professor produced a lengthy study titled, Mineral Tax Incentives, Mineral Production and the Wyoming Economy. The study showed how raising or lowering the severance tax by two percent had no effect on exploration or development. Production of oil and gas is driven mainly by reserves, not by prices, production tax rates, or production tax incentives,” Gerking wrote. Sarah Gorin of the Casper-based Equality State Policy Center said when Gerking’s study came out, the mineral companies “had a fit.” Sympathetic lawmakers joined in. During a December 8, 2004, meeting of the Legislative Management Council, former Wyoming state Rep. Fred Parady (R-Sweetwater) proposed that further funding of Gerking’s study “be deferred” and left for consideration in the next session. Wyoming’s bulging treasury has perhaps induced a lull in the conversation about severance taxes. In 2008, Wyoming collected $443 million in severance taxes. Just ten years ago, Wyoming collected $231 million, not a bad increase for decade. A recent poll suggests that despite its generally conservative bent, the Wyoming public supports a severance tax increase. In 2007, a Democratic political research company, Project New West, hired the polling team Grove Insight/Meyers Research to conduct a survey of Wyoming voters. Until now, the results have not been released to the public. Thus the public seems ready for a discussion about severance taxes, but the legislature is not. Compared to other states, record energy prices brought only modest increases in Wyoming’s severances tax collections. Within a two-year period, 2005 to 2007, the peak of the most recent boom, Wyoming’s taxable value for minerals decreased from $14.6 billion to $13.8 billion. Taxable value is multiplied by the severance rate to determine the amount of severance tax due. View a graph on the decreasing tax value here. According to a study called State Energy Revenues Update, written by the National Conferences of State Legislatures, for 2004 to 2007, Alaska had a 243 percent increase in severance tax collections; Montana had a 217 percent increase, North Dakota had a 122 percent increase. During the same time, Wyoming’s severance tax collections were up just 53.6 percent. If Wyoming has a value-based severance tax system and producers enjoyed record-busting natural gas and coal production and prices, why were Wyoming’s increases in severances tax collections so small? Craig Grenvick of the Wyoming Department of Revenue says part of the reason for such a small increase in tax collection from 2005 to 2007 were low (or lower) prices for natural gas. Natural gas makes up 52.5 percent of Wyoming’s severance tax income. The consequences of such decreases matter in states like Alaska and Wyoming. Both states distinguish themselves from the rest of the pack by the role energy taxes play in overall state revenue. For example, in 2007, Texas led the nation in severance tax collection, $2.8 billion, only seven percent of the state’s overall tax collection. Both Oklahoma and New Mexico collected more severance taxes than Wyoming in 2007, but energy revenues were less than 16 percent of overall revenue for each state. These differences ultimately add to or subtract from what goes into a state’s permanent fund. Again, Alaska’s permanent fund, started in 1976, is now worth $28.5 billion, even after the latest economic hit. Wyoming’s permanent mineral fund was started in 1974. It has $3.7 billion. By contrast, Norway’s Government Pension Fund, funded entirely by energy taxes and started in 1990, is now worth $300 billion. This figure, so much higher than any other American permanent mineral trust fund, gave Alaska pause as they calculated their new severance tax plan. To read more stories like this, join the WyoFile E-Newsletter list and get regular updates on articles and special reports. Your article, “Does Wyoming Get Enough for its Mineral Riches? was wonderful. Congratulations on unearthing a ton of data on severance taxes. I think the article deserves wider publication. Would the New York Times be interested? Your pro and con arguments probe more deeply into the problem than any article I’ve ever read. T.A. Larson’s History of Wyoming would back you up on the idea that we have always been threatened by energy companies who claim they will leave if taxes get too high. After reading your article, I wonder if a companion piece could be written on where energy corporation monies go? If the claim is: “Well, they go to stockholders, of course” then it might be interesting to see which stockholders receive most of the money. Also, how do CEO salaries figure into the division of the profits? What percentage to the blue-collar workers get? I’ll bet the comparison would conjure up an image of slavery akin to the Egyptian use of forced labor to build the pyramids, or perhaps, in a more modest vein, the sharecroppers of the Reconstruction era days in the South. The issue, of course, as you seem to indicate in your article, is “fairness”. What’s fair? Is it fair to pay armed guards (read: lawyers) to keep the masses from raiding your grain bins? As you can tell, I totally support your point of view and encourage the dissemination of your work to the greater public. Thanks for your good, hard work.